« Special Blog Coverage of 3D Cities Coming in November! 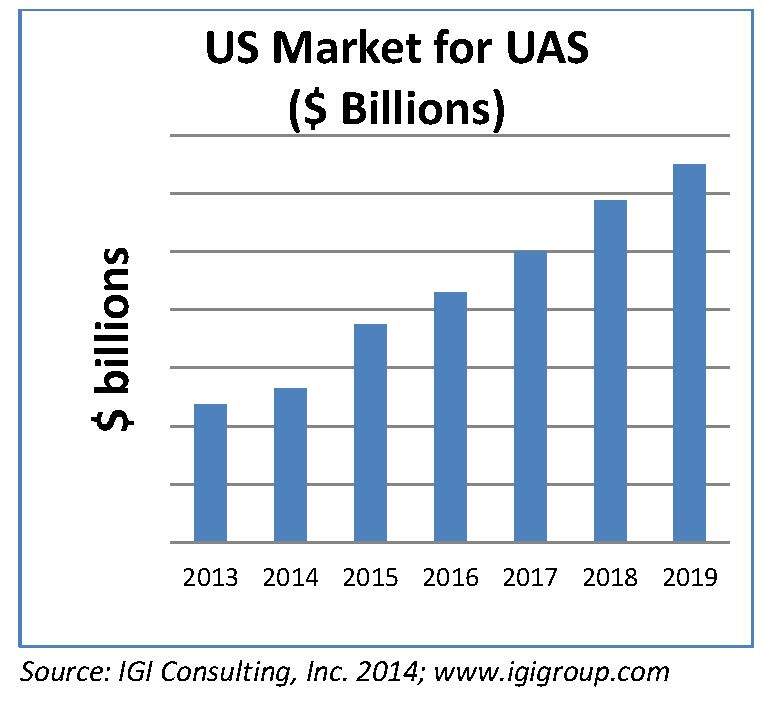 According to Information Gatekeepers, Inc. (IGI)’s recent “2014 UAV Market Research Study” (October 6, 2014), this market will be driven by growth in the commercial and Do-It-Yourself markets. IGI Consulting Inc. estimates that the U.S. market will grow from $5 billion in 2013 to $15 billion in 2020. The research report also takes into account components, subsystems, and platforms. IGI sees the major commercial applications for UAVs to be agriculture, real estate, filmmaking, oil and pipeline, specialized package delivery and electric utility. They state that after the FAA decision on UAV Access to the National Airspace is made in 2015, there will be significant growth in the market. The federal government has used “drones” for some time in their surveillance of military installations behind enemy lines. Now Unmanned Aerial Systems or UAS are being explored by companies like Amazon and UPS who want to offer more specialized package delivery services from the air. As is always the case, the shifts in technology, bandwidth and ease of use make possible the implementation of new technologies. This is certainly the case with UAS. The ease with which point clouds can be gathered and created from photos has been one of those shifts. Miniaturization, guidance and control systems, point clouds, “sense and avoid” technology, connectivity and sensors are among the technology advancements that UAVs have embraced. There are two types of UAVs available – fixed wing and multi-rotor. Fixed wing aircraft are generally better for collecting data from large areas, while multi-rotor are better for small areas. Many firms such as Trimble have been in the precision farming, construction and geospatial market for some time and see UAS as a natural progression. They got their own craft in the beginning of the UAV craze. Trimble UX5 Aerial Imaging Rover combines a robust and highly user-friendly system with a custom-designed camera platform. “The UX5 takes advantage of Trimble’s longstanding expertise with mapping and surveying, providing those professionals with the highest accuracy for impressive deliverables,” said Todd Steiner, director, Product Management for Geospatial Optical and Imaging Solutions for Trimble. The UX5 camera has a large imaging sensor that captures very sharp, color-rich images, even during cloudy or dark conditions. The 16.1 MP camera with custom optics give the UX5 the ability to capture data down to 2.4 cm (0.94) resolution. The imaging rover can be used in a variety of rugged environments and weather conditions such as snowy mountain terrain, windy seashores, and arid deserts. An advanced control method based on reversed thrust results in accurate and predictable landings, which can be an issue for UAS. The production method for the UX5 patented by Trimble is extremely durable with impact resistant foam structure and internal and external composite elements. Typical use cases include open-pit mines, oil and gas properties, construction sites, waste management and landfills, agriculture vegetation management, change detection, survey and mapping. Aeryon Labs Inc. manufactures and designs sUAS, that are currently used in commercial, public safety and military applications. Aeryon stresses that their sUAS are aimed at professional users and those who want to collect high resolution photos, video and data for their work. Intuitive point-and-click touchscreen navigation and flight planning, advanced features and automated fail safes. Integrated payloads and software solutions. senseFly announced eXom, the next-generation rotary drone that offers professional users situational awareness. 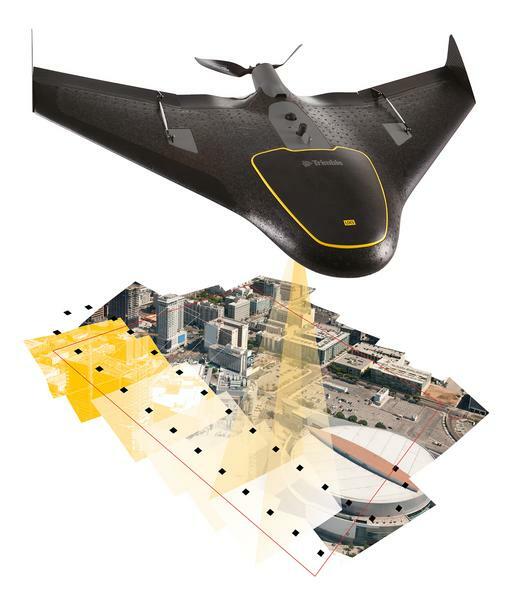 SenseFly began in 2009 as a spin-off of the EPFL*-based Laboratory of Intelligence Systems, a leading research organization in robotics and artificial intelligence. Since summer 2012, senseFly is a member of the Parrot group, a global leader in wireless devices for mobile phones. According to company materials, in addition to seeing what its TripleView camera head sees, eXom’s five vision sensors also enable you to see in the direction the drone is moving – like the visual parking displays in modern high-end cars – for enhanced awareness and safe operation. These sensors work in harmony with eXom’s five ultrasonic sensors to ensure you always know the drone’s distance from nearby objects. Plus, eXom includes the extra security of automated proximity warnings, and shock-absorbent carbon fibre shrouding protects eXom’s rotors in case of surface contact. The eXom’s autopilot-controlled TripleView head allows you to view and record any type of imagery required – HD video, ultra-high-resolution stills, thermal data, or all of the above. All without needing to land in order to swap cameras. Since its head faces the front, eXom can fly up close to target structures for sub-millimetre data resolution. The head’s 270° vertical field of view also means eXom can document objects directly above it; crucial for challenging tasks such as inspecting underside of a bridge. eXom’s level of sensory intelligence means it is easily controlled, even in the most demanding situations (e.g. approaching a high target positioned hundreds of metres away), without the need for a remote control or piloting skills. Altavian’s Nova family of professional UAVs are built for every mission scenario, and includes drone technologies that work seamlessly together to provide a complete data collection workflow. The Nova System brings together the platform, payload and control options that will meet both data requirements and operational profile. The professional-grade components in the Nova System are fully cross-compatible so it can be deployed now with the capabilities and flexibility to upgrade to new technology or respond to changing requirements. 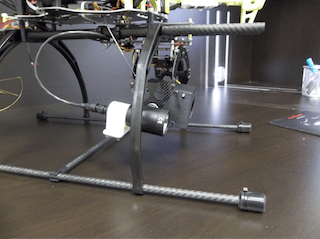 Phoenix Epoch UAV is a remotely controlled heavy-lift multi-rotor UAV designed for LiDAR and photogrammetry payloads, and features a waypoint enabled navigation system, a folding frame to make it easily transportable, and up to 20 minute flight duration. Pix4D recently announced its partnership with 3DRobotics, a U.S. drone manufacturer. 3DRobotics is launching two mapping platforms for fully automated, all-in-one 2D and 3D mapping. The multi-rotor X8-M and fixed-wing Aero-M are bundled with a special edition of Pix4Dmapper (LT 3DR Edition) allowing to produce 2D results. Upgrade for 3D results is available with Pix4Dmapper Pro 3DR Edition. Altavian offers a range of industry-leading payloads that ensures users are getting precise data at the right price point. The company’s proven expertise in sensor technologies and drone operations results in payloads that are proven field-ready and are backed with a complete data workflow. The Nova MP32 Metric Mapping Payload provides industry-leading precision and accuracy. Utilizing advanced 29 MP imaging at 5.5 micron pitch and surveying-grade GPS navigation sensors, you can maximize your data collection productivity and produce best-in-class data. The Nova MP21 provides a quality mapping payload at an entry-level price. Available with standard GPS and integrated AHRS with realtime GPS-aiding, it provides reliable georeferencing accuracy for most applications. The Nova VP23 is a capable gimbaled video payload that features both daytime/nighttime (EO/IR) modes, as well as laser illumination to meet your most demanding ISR needs. DRG’s Ageon Epic is an enterprise PED for the intelligence community, with cloud-based sensor C-2 and multi-INT PED. With a history in the defense and intelligence industry, Ageon brings that expertise to the commercial market with global information and intelligence sharing, web-based widget-based user access, multi-INT data streaming and cross domain transfer, OWF compliant and part of the Red Disk/IC ITE Environment. In speaking with a representative of the company, he said that the military has been making these drones for years, and spent a lot of money on them, whereas now perhaps they can learn to make them cheaper and lighter weight to accomplish the same tasks. The military is also interested in the growing commercial market for drones. Phoenix LiDAR Solutions are survey grade and allow lightweight mapping systems with great accuracy and photogrammetry options that are designed for use with the Epoch UAV and in other applications. Trimble’s Access Aerial Imaging application is loaded onto the Trimble Tablet Rugged PC and operates the Trimble UX5, so that the system relies on a single software tool and workflow for all tasks: planning aerial missions, performing pre-flight checks and monitoring flights. Trimble makes the process of flying their UX5 very simple by giving simple instruction for the operator from pre- through post-flight sequences with step-by-step digital checklists. The workflow that is provided with the Access Aerial Imaging application hastens the time to fly so that the UX5 is ready to fly in just five minutes. The Nova Manager Suite from Altavian integrates operational logistics, flight planning, payload control and post-mission data management into an efficient workflow. Altavian bundles this software with every system purchase. Altavian provides two different drone technologies, Nova F6500 and R8400, tuned for highly efficient data collection in a wide range of mission scenarios. Drones must be optimized for efficient operations to keep data collection costs down. Pix4D has developed and distributed its own proprietary desktop software package called Pix4Dmapper that allows the conversion of thousands of aerial images, taken by lightweight UAV or aircraft, into geo-referenced orthomosaics, DSMs, DTMs and point clouds, index maps, texturized 3D models and simplified CAD models. Pix4D is highly intuitive and fully automated and features easy-to-use assessing, editing and sharing features. Pix4D also allows users to retain control of their projects in the software itself, with integrated editing tools, such as the rayCloud editor. 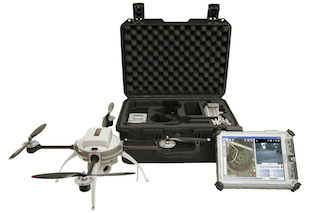 Many UAS already come bundled with Pix4Dmapper in various formats. Partners include senseFly, Aeryon Labs, 3DR, Delair-Tech, Uaver and more. RIEGL manufactures laser scanners for terrestrial, airborne, mobile, industrial and unmanned applications. RIEGL develops 2D airborne scanners for UAS as well as the VQ-820-G topo-bathymetric scanner for use on board the Schiebel Camcopter. Using their expertise in this area, RIEGL developed a new instrument dedicated to the smaller unmanned aircraft. This instrument is the VUX-1, announced in spring 2014, the first scanner, according to the company, that is specifically designed for UAS integration with survey-grade data quality. It is extremely lightweight, flexibly mounted and covers a very large view field. RIEGL VUX-1 is well suited for power line and pipeline inspection, forestry and agriculture applications, construction site monitoring, vegetation monitoring and mining. These are survey missions that are difficult to access or have to be carried out frequently. Mapbox provides a platform for creating and publishing custom maps. Those who are interested in Mapbox are imagery analysts and UAV operators who use it to host and share their imagery, and analyze data in context. SUREFIRE LLC illumination products are an illuminating addition to the list of products tapping into the UAS market. According to vice president, Surefire Business Development George Atchley, Surefire products offer a variety of light output using Light Emitting Diode (LED) and patented lens and reflector technologies that allow for various outputs of light, using minimal power. The focus audience for this technology are UAS operators who need a light while operating their systems, for landing, takeoff, film, photograph and surveillance. Atchley says users may need light for monitoring infrastructure, inspecting large areas after a disaster or looking at high angle or elevated structures. DAT/EM Systems International develops software which enables the extraction and editing of 3D vector features from stereo imagery and point clouds. The newest addition to the DAT/EM Photogrammetric Suite, SUMMIT UAS provides a set of tools to critically analyze or compare UAS data by viewing, editing and defining features. SUMMIT UAS will be available later this year. 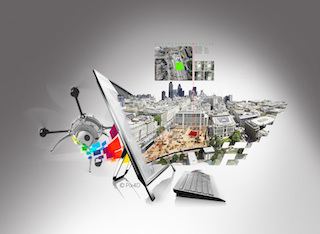 DAT/EM offers an entire interconnected suite of photogrammetric software, the components of which connect in turn to mapping applications from a variety of top-tier providers. SUMMIT UAS offers many stand-alone features like the DAT/EM drawing tools for viewing, terrain following, editing and mensuration. However, if the customer needs to expand their use of UAS, DAT/EM offers easy ways to link to other applications and increase the use of the data. Esri offers management of imagery collections from UAS and disseminates resulting imagery products with other spatial data. The GIS company works with multiple partners and providers of UAS systems. Their goal is to make imagery and resulting products accessible and integrate them into decision support systems. LP360 from QCoherent Software LLC (a GeoCue Group company) is an advanced point cloud exploitation product that runs either as an extension of ArcGIS Desktop or as a 64-bit standalone Windows application. Recently the company has added new features to support point clouds derived from overlapping images (“multi-ray photogrammetry”). Looking forward, QCoherent expects sUAS will be the most common source of this image-based point cloud data. The pros for using UAS include cost and efficiency, rapid deployment and surveillance, ease of use, GPS coordinated flight and hover, stability, and adaptability of the platform for modifications. According to one respondent, combining UAV imagery with an appropriate software package allows production of the same survey-grade quality results as are achieved with ground surveying, photogrammetry or LiDAR. Also the time spent on site as well as data processing time is cut drastically using UAV technology, in some cases, up to 10 times. This also allows more people to produce their own maps and 3D models. Currently one of the setbacks is that the range that UAS can cover is relatively small. Some areas are still too big to be covered with UAS. Another possibility for these larger areas is to use manned aircraft with the same software technology as applied to UAS, which is offered by SkyIMD’s new manned UAVs. Another respondent said that as a result of the lack of national regulations and restrictions, the preparation of a mission, is for now, very time consuming. This will change but for now UAS is a new airspace participant that is not fully integrated into the FAA’s lexicon of safety, privacy and security rules. As is always the case, technology blazes ahead of standards and regulations. FAA guidelines for flying are well established and structured for manned aircraft, to ensure safety, privacy and security and friendly skies. UAS represents a newcomer to the airspace, so it will need to comply with FAA safety standards and technical certification. Stewart Baillie, Unmanned Systems Canada, an organization that represents the industry, users and government of UAS in Canada, said that his organization is involved in outreach and regulatory groups in Canada. The disruption that UAS is creating is one that is truly upsetting the apple cart of what has traditionally been viewed as technology available only to a select few. It is no wonder that the military, satellite imaging, remote sensing, aerial imaging, filmmaking and laser scanning companies are all taking a great interest in the fast-growing UAS industry. The production workflow for UAS collection will definitely be different than for traditional remote sensing. Finally, getting into the act are some filmmakers: This video is what some skiers and professional photographers were able to produce with off-the-shelf technology and about eight hours of training using 3DR IRIS+. This entry was posted on Thursday, October 23rd, 2014 at 6:45 pm. You can follow any responses to this entry through the RSS 2.0 feed. You can leave a response, or trackback from your own site. 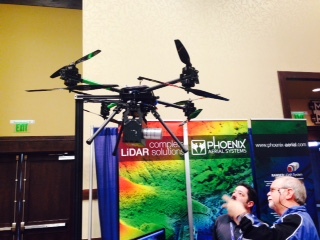 Thank you GIS Café for such a thorough and excellent coverage of UAS MAPPING 2014 RENO!